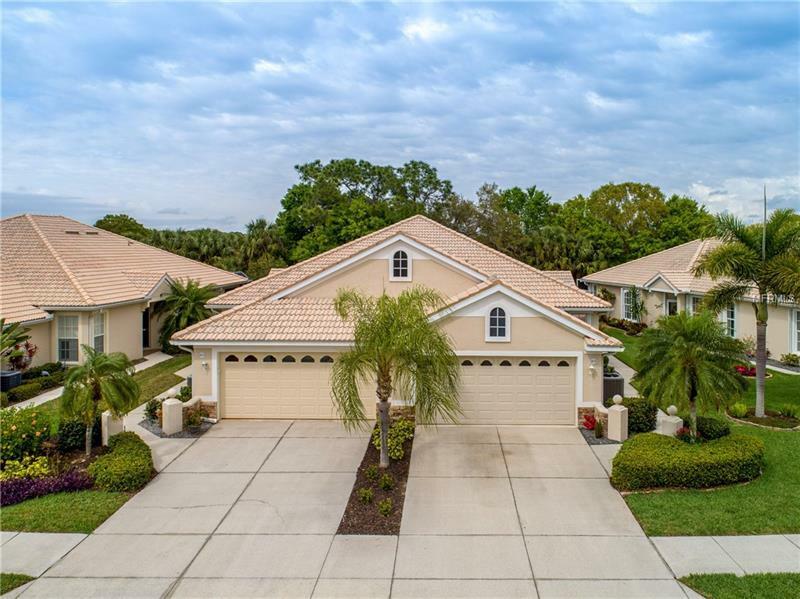 Welcome to the epitome of the Florida lifestyle with this delightful 3 bed, 2 bath plus 2-car garage villa in the highly sought after Pelican Pointe Golf & Country Club community. The well maintained home boasts many upgrades throughout including pristine hardwood flooring in the main living areas, plantation shutters, skylights, and electric storm shutters. The spacious and bright and airy living area leads to the open kitchen features cabinets with custom pull out shelves and a breakfast bar. Just beyond the kitchen is an interior laundry room complete with washer and dryer. Enjoy your morning coffee in the large screened-in rear porch which overlooks the gorgeous lush tropical landscaping. The gated Pelican Pointe Community has a heated pool, tennis courts, fitness room, a fantastic clubhouse, library, and of course, golfing. The HOA fee includes cable and internet and a 24hr guard gate. This is a wonderful community for all ages and styles of living and would make a great home or seasonal getaway. Located just minutes to Historic downtown Venice and award-winning Venice beaches.